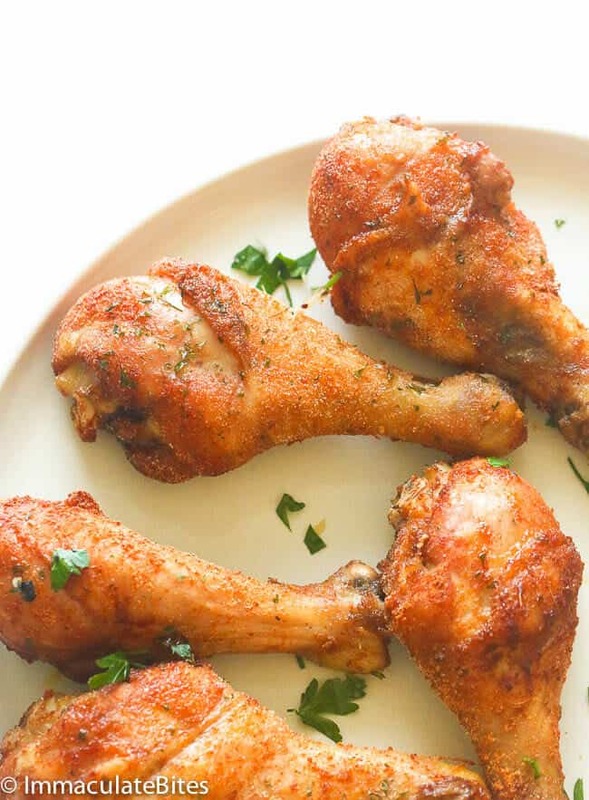 Baked Crispy Chicken Legs – A few simple tricks makes this chicken legs crispy on the outside, tender and juicy on the inside, and ridiculously flavorful. It’s quick, easy, paleo, gluten-free and only requires 10 mins prep. Inspired by the success with this crispy baked chicken wings that I made here. I decided to give it a spin with chicken legs- same flavorful bite and crispy crunchy coating without the aid of breadcrumbs or flour. Since chicken drumsticks are larger than wings, I included a generous amount of onion, garlic to compensate for it’s size- to fully permeate the chicken. I switched out the thyme for Italian herbs, you can use any other dried herbs that you have on hand. 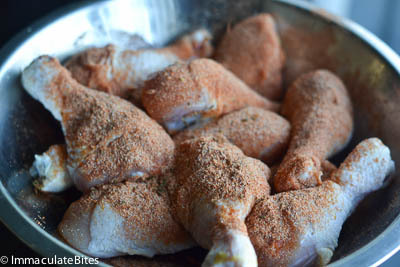 The most important thing about these baked chicken drumsticks is ensuring that they are dry. The chicken legs need to be as dry as possible to crisp up the skin. 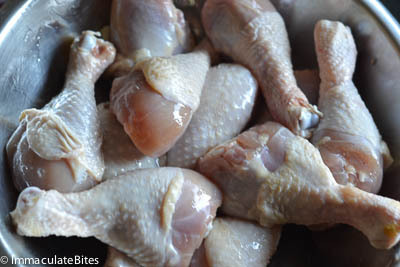 Don’t forget to drizzle them with a little bit of canola oil and bake rotating the chicken legs half way through baking . For easy clean up, line the baking pan with foil paper. Serve them up with this pepper sauce or any hot or dipping sauce of your choice. 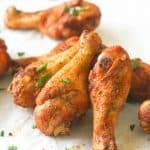 Baked Crispy Chicken Legs - A few simple tricks makes this chicken legs crispy on the outside, tender and juicy on the inside, and ridiculously flavorful. It’s quick, easy, paleo, gluten-free and only requires 10 mins prep. When ready to bake, preheat oven to 425°. Place the chicken in a large bowl, with all the spices, and then drizzle with oil. Bake chicken legs until cooked through and skin is crispy, about 45-50 minutes-rotate chicken legs half way through-roughly 20 minutes. I made these and the crispness and texture was PERFECT, mine seemed to come out a bit too salty…I followed the measurements as the recipe stated EXCEPT I crushed 1/2 Chicken Bouillon cube, is that what did it? Still amazing and definitely making these again…my whole kitchen smelled amazing! That may probably be the culprit. Next time cut back on the salt if using bouillon cube. 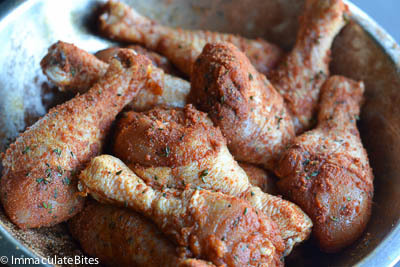 Ive been seasoning drumsticks with Old Bay for years. Its nearly perfect. Very tasty! Loved the spice mixture. This recipe became an instant favorite in my house. I have made them several times. I try to stay as close as possible to the original recipe because it is just about perfect. That being said, it is also very flexible and forgiving if you’re missing an ingredient or two. The only thing I did differently was add a bit of brown sugar to the spices and it was incredible. Thank you so much for the amazing recipe! I’m always lost with chicken drumsticks. These were perfect! These were so yummy. I cooked the legs on my oven’s convection setting which put the temp at 400. I probably should have pulled then out at around 40 minutes. I also added 2 tsp of baking powder to the spices as I had read several recipes that said this makes chicken skin crispier. I am not sure how much doing these additional steps helped but the skin was so crispy. I had some extra spice mix so I tossed it with cubed sweet potatoes and olive oil and roasted them under the rack of chicken. The family loved this recipe. Thanks for posting! GUYS! This is so super simple, delicious, full of flavor and the whole family LOVED them! Hubby complemented them several times and went so far as to say the best chicken he’s ever had from the oven!! I used the drying method but only let them sit in fridge for 45 minutes. I also omitted the Italian herbs by accident and I did not use the bullion crumbs or whatever lol. Hubby said it did not need either. We also did not use any sauce. It didn’t need it! Can I make these without a wire rack? Will it change the chicken drastically? You sure can. It will be less crispy. Yes. I DO IT ALL THE TIME! Just put in a pan an keep uncovered… if you have to.. pour the excess water/ oil off as it cooks. Baking legs now & have 4.5 lbs worth so literally praying that they’ll all cook thoroughly in same time? If it’s spread out in a single layer it will. If not it usually takes a few more minutes to cook thorough. THESE REALLY ARE SO GOOD! Was a bit skeptical of all the rave reviews – but just made these and we are all loving them (my 6 year old is literally licking his fingers – haha)! I just paper towel dried before the seasoning as I didn’t have time to dry out in the fridge and they still came out quite crispy. Can’t wait to try the fridge method next time. Tonight i be trying this recipe for the first time. I love oven fried chicken but needed something with less carbs. I think this will be a winner from all the previous post. Will comment after dinner. But im sure im going to love it. Thanks for sharing. Can’t wait to hear how it worked out . 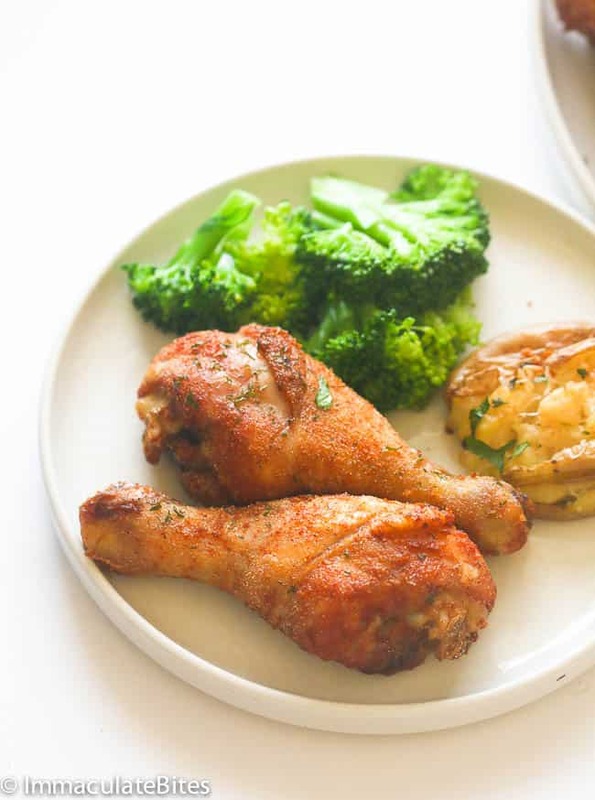 This is the best chicken leg recipe hands down and my kids loooove it. The receipt says “drizzle with coil” I’m thinking this should read “drizzle with oil”. Thanks Patsy will update recipe. Very yummy! I passed the recipe along to my daughter. 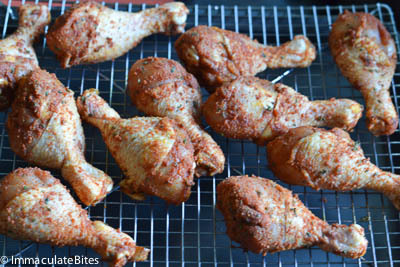 I made whole chicken legs (cooked about 20-30 min longer at 400) and dipped pieces into Chipotle sauce. Tasted great and I love the crispiness. I don’t think you can really go wrong with this recipe. A winner! Thank you. Who knew baked chicken could be so easy! THis is our new family favorite and now I make it for company. Amazing!! My husband told me if I had made this when we were dating, he would have married me right then! We were both really impressed and loved the spice combo. I got four compliments from him throughout dinner about how great it was! Is it same as you are using in your recipe? Eagerly waiting for you reply. Yes it is. Omit if you do not have it readily available. 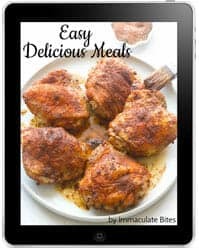 I have made this recipe numerous times with legs and also thighs and this is my favorite chicken recipe and guests all had positive feed back. (Thank You for this recipe). Just found this. These are awesome! Thanks. Just made this today and it was delicious! My hubby said they were the best chicken legs he has ever had. Thank you! I literally never comment on recipes (or on any other type of post, for that matter) but O…M….G these are out of this world so I just had to say something. I had high doubts that the chicken would actually come out crispy but it did!!! I dried them well with a paper towel and was only able to let them sit in fridge for 1.5hours but they were PERFECT. Making this again tomorrow, as the twelve legs I made yesterday didn’t last long in our family of five! Can I leave frozen legs out to thaw and get same results as if I refrigerated them? I made this for lunch today and hubby and kid loved it. It is a Little spicy but not overpowering. The skin wasn’t as crispy as I had expected but wasn’t rubbery either. Great recipe. YUM, Love this recipe! It’s been a weekly staple in our house over the last year. Thank you so much for sharing! I usually make the spice rub ahead of time for an even faster weeknight dinner. Making the spice rub ahead indeed saves a lot of time. Glad you love this recipe as much as I do. 🙂 Happy weekend! My family loves this recipe! They literally don’t want me to make drumsticks any other way again. I thought at first they might be a little too spicy, but received nothing but happy responses from my husband and step son. My husband and I plan on using this awesome rub for some grill food come warmer weather! Thank you for this great recipe, I hope you have a lovely new year! Mine weren’t crispy. I even tried them out overnight in the refrigerator. I’m going to try putting them on for real for a few minutes each. I’ll try this recipe again because it sounds so good. Sorry to hear about this. It works all the time for me, the trick is to make sure it’s not wet when baking . So you don’t put anything in the pan such as oil,etc…you just put the seasoned chicken in the oven and that’s it? I have tried it both ways and it works. Add oil or not it still comes out tasty. WOW! I love when I stumble upon a website with great recipes! I was entertaining the other night, for a group I like making chicken legs and was just looking for something different! I am a daring person also as I was trying a new recipe on guests! I just read the comments and your instructions and knew they would be great! Love your videos also. They were fabulous, got asked for the recipe and everyone was raving over them! Thank you so much, looking forward to trying other recipes from you, the chai is next! Thank you for dropping by, Susan! Can’t wait for you to try my chai latte. Cheers! Yes it is. Whatever rocks your boat. Made these tonight. Definitely a hit. The man loved them and ate 4 pieces! Only difference I made was using garlic salt (i ran out of just garlic powder), no pepper (i forgot lol) and I added a sprinkle of curry powder. They came out perfectly crispy, juicy and flavorful. I baked for 50 mins (25 per side). Made these last night for dinner. What a hit! This is by far one of if not the best chicken leg recipe! Thank you for the awesome feedback, Pamela! Have a lovely weekend! I had serious misgivings about this recipe. There are so many recipes and even cooking appliances that say they make the outsides crispy and they don’t. But this recipe definitely did!!! Delicious crunchy crispy spicy skin and insides were juicy and flavorful. 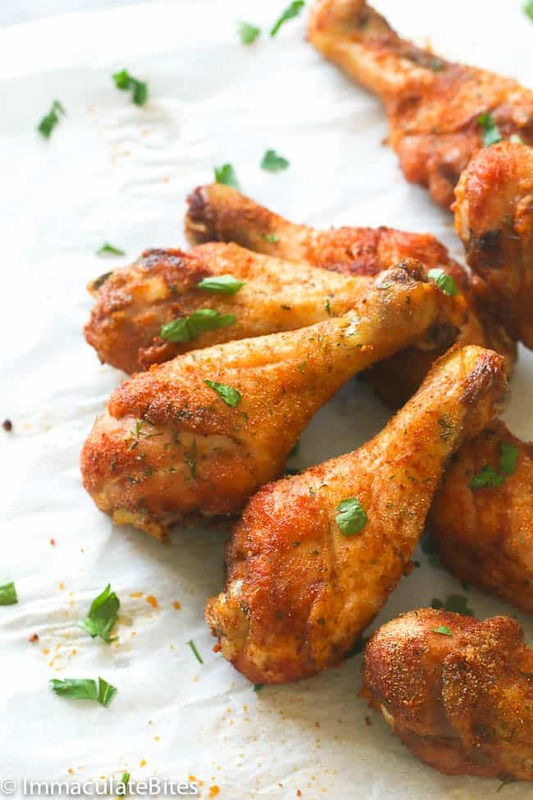 I cooked 5 skin-on bone-in chicken drumsticks, approximately 2 3/4 pounds, so I cut the spices about in half and reduced the cooking time about 5-10 minutes, especially for two of the smaller drumsticks. I think good paper towel drying is the key to having the spices stick to the skin which is necessary for crisping. I love spicey foods but I may have gone a little bit too heavy. I used Old Bay seasoning and Brew Pub chicken seasoning for the chicken bouillon. Could have been a bit of overkill Lol! Thank you very much for a fantastic recipe. I will definitely use it again with chicken parts and maybe pork chops and even some veggies. You’re always welcome, Tanna! I’m so happy you like this recipe. It’s one of our fave chicken recipe, too. P.S. these really give our famous Gus’s a run for their money with that cayenne, and they’re way healthier! Will this work without the rack? I dont have one and dont want to go to the store. Ok, they’re in the oven. But I have to say….. I may have SUPER screwed this up. I forgot to dry the chicken with paper towels first. I used a ziplock to coat them in spices and after reading the comments, I think I used WAY too much oil. I DID however put them on a rack in the oven, the one thing I did right. Also I didn’t have and Italian seasoning mix so I tried whole foods poultry seasoning and added oregano, marjoram and basil, then combined the other spices per the recipe. Fingers crossed this isn’t a disaster! Just unplugged the smoke detector LOL! Made this today. So easy and yummy! My drumsticks were still half frozen so I kept them.in 30 min each side and they were perfection. Love this! Thanks for letting me know, Kelly! This is one my fave chicken recipe, indeed. I have made these a couple times now, and all I can say is, wow! Super easy, and so so delicious. Thank you for the recipe, love it!! Thanks for dropping by, Dawn! I appreciate it. 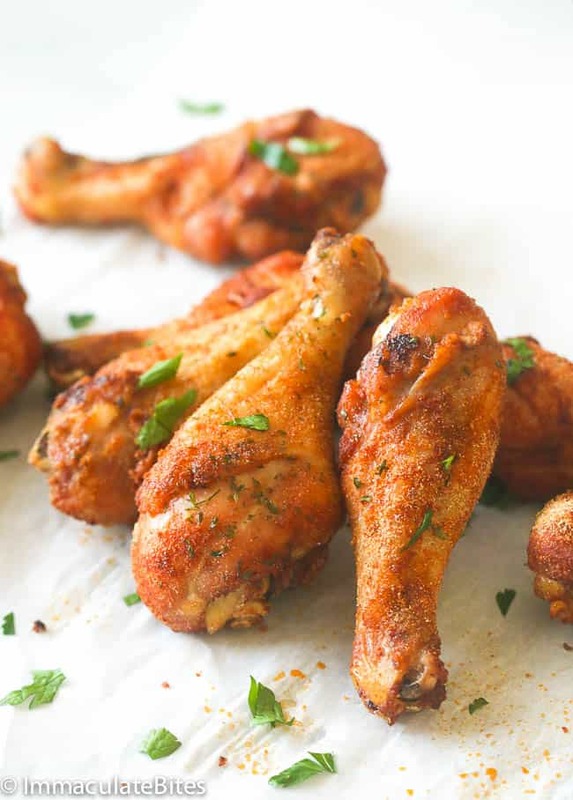 Bake chicken legs until cooked through and skin is crispy, about 45-50 minutes-rotate ** wings ** half way through-roughly 20 minutes. Will be cooking these up tonight, thanks, I like the tip of drying them out in the fridge. I never leave reviews, and as a Celiac, I cook A LOT…. but this recipe is PURE PERFECTION and I had to say so! I dried them well with paper towel, tossed in a little canola/olive oil, then used onion powder, garlic powder, paprika, chilli powder, a pinch of cumin, freshly ground black peppercorn, and grey sea salt. Didn’t realise what a difference it made making sure the drummies were completely dry first. When they were done, I was ready with my bottle of Frank’s Red Hot Sauce (I put that $#!t on everything! ), but tasted the chicken first and didn’t use a drop of sauce. They are perfect as they are..
Great Recipe! Thanks for the easy way to serve a great chicken dish without a lot of hassle! Delicious! Awesome! Glad to know it worked out well for you. I’m so disappointed and through no fault of the recipe. I am tired of trying to be thrifty and buying chicken legs on sale (this time for $.79/lb) and then being HUGE. So huge I had them in the oven for 1 hour, 20 minutes and the bigger ones still weren’t done. And by that point, I was done with it all, because I made a lot (for 9 people) and it was really smoking up the house when I opened the oven. I would love to try these again with smaller legs. The flavor was really good. Sorry to hear it happened that way, Melissa. Please let me know how it turns out on your next try. try baking at a lower temp for longer and less oil. Interesting that the recipe doesn’t change the bake time for larger quantities. The more potatoes you put in the oven, the longer it takes for a baked potato to be done. The same thermal transference applies to more chicken legs, too. What do you mean by bouillon powder. Like chicken bouillon powder? These were delicious!!! Both my husband and I loved the seasoning, and the crispy exterior. Today, I’m making this with chicken thighs! Thank you! Glad you both like it, Gabriela! ENjoy! It’s a keeper. Glad you love it, Bolivia! Perfection! I was a vegetarian for decades, now transitioning to cooking and eating meat again. With this recipe, no one would ever know I hadn’t cooked poultry in ages! So delicious. Thank you! You’re most welcome, Jill! This recipe is easy to follow through while using simple ingredients. Thanks for stopping by!